"Arafel": "What You Need to Know About DARPA, The Pentagon's Mad Science Division" (& "Super E.M.P" Weapons) "
"What You Need to Know About DARPA, The Pentagon's Mad Science Division" (& "Super E.M.P" Weapons) "
Quote: "There's a certain entity within the Pentagon that's quite (in)famous for developing terrifying robots, advanced weapons and futuristic tech. It's called the Defense Advanced Research Projects Agency or, as most people know it, DARPA: the Department of Defense's "mad science" division. While all the machines coming out of the agency make it seem like its sole purpose is to build a killer-robot army, DARPA has many, many other projects to speak of. In fact, DARPA's at the heart of some of the most significant technological advances of our time. Hell, there might not be an internet to read this article on if DARPA didn't create it. President Dwight Eisenhower founded DARPA way back in 1958 in order to develop cutting-edge technologies for the United States. Originally known as ARPA (same meaning, but without "Defense"), it was created as a response to the Soviet Union's successful launch of Sputnik, which, according to DARPA itself, signaled that "a fundamental change was needed in America's defense science and technology programs." Since then, it's been involved in several technological milestones; for instance, it developed an early networking system that went live in 1969 called the ARPANET. It's one of the networks that eventually led to creation of the internet, which, suffice it to say, changed the world. Love Siri or Cortana? You can thank DARPA for those virtual assistants, too, as its Speech Understanding Research (SUR) program in the 1970s played a key role in advancing speech recognition technology widely in use today. Despite being part of the Pentagon, DARPA operates independently from the Defense Department's military research division. Its personnel are divided into groups led by a manager, with each one tackling a particular issue the agency wants to address. These teams are free to look for ideas that would solve the problems they're given both from within and outside the organization. DARPA then provides each group with anywhere from $10 to $40 million in funding. Some projects receive far less funding, but big projects could get up to $100 million. If you're wondering, the agency had a $2.78 billion budget for the 2014 fiscal year and is currently requesting $2.91 billion for fiscal year 2015. One of the first robotic projects DARPA has ever funded is Shakey the robot, which began development in 1966. Shakey was a multi-purpose machine on wheels that could perform menial tasks like switching lights on or off. These days, the agency's probably most known for its advanced machines, some of which look undeniably unnerving. These include a number of Boston Dynamics creations, such as the four-legged Cheetah, which later became known as WildCat, that can sprint faster than Usain Bolt. 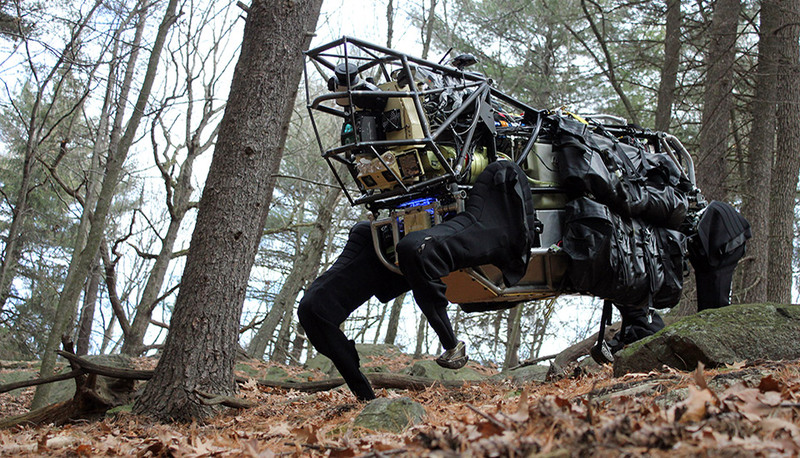 BigDog, one of the company's other DARPA-funded projects, is also a four-legged machine designed to traverse tricky terrains while carrying heavy supplies and equipment. Other than those two quadrupeds, Boston Dynamics continues to refine its disaster-response humanoid machine, called Atlas, for the agency. It's even preparing the biped to walk without a tether before the year ends. When the company was acquired by Google last year, it promised that it would still fulfill its military contracts. But as Mountain View made it clear that it won't be pursuing government funding, it's likely that we won't be seeing a new DARPA-funded Boston Dynamics robot again. Don't worry -- it's not like the agency doesn't have other ways to look for outstanding ideas to add to its roster. DARPA also hosts an annual Robotics Challenge, with the intention of funding the one that wins top honors. This year's ongoing contest is looking for a humanoid robot to serve as first responder in times of disaster. Sadly, the strongest contender just dropped out, because (surprise, surprise) Google bought SCHAFT, the Japanese company that designed it, last year. SCHAFT is now gearing up to produce the first retail Google robots, so the acquisition sounds like a good thing... unless you're worried that Mountain View's forming a robotic infantry of its own. DARPA's bionic limbs have also been making headlines in recent years -- after all, the division has already sunk $150 million into its prosthetics program. Its earliest mind-controlled bionic arms have been serving their owners for years: The first woman and fourth patient to get one had hers attached back in 2006. Even so, the agency's not resting on its laurels and hasn't stopped trying to come up with better products. 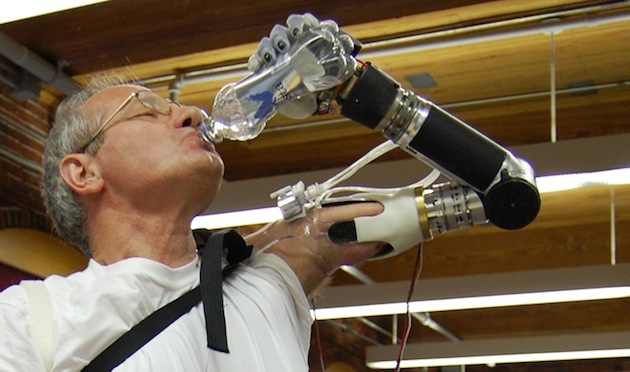 In 2013, DARPA took a project that's developing a low-cost, three-fingered artificial arm under its wing and also started working on a brain-controlled arm that can feel. Just this May, the FDA certified the DARPA-funded "Luke" arm, which can understand several commands at once and was developed by the same man who designed the Segway. Hey, DARPA's part of the Pentagon, so it goes without saying that it plays a huge role in developing new military technologies. In 2011, the division tested a hypersonic weapon by flying it across the Pacific Ocean, while it signed a $6 million contract to develop highly accurate laser-equipped sniper scopes last year. 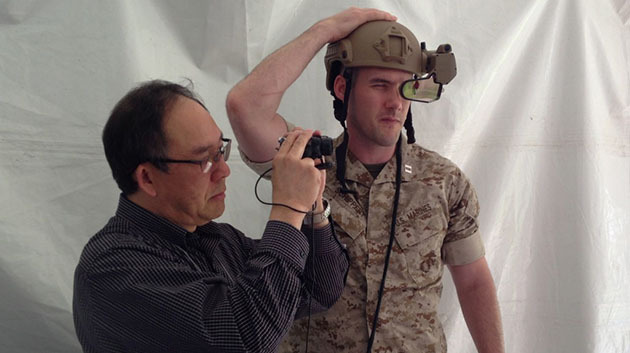 More recently, the agency unveiled a head-mounted display that tracks friends and enemies alike and lets soldiers communicate with each other. Of course, DARPA wouldn't be DARPA if it wasn't brewing something totally out of this world. Some of its crazier-than-usual projects include developing the technology to climb walls like Spider-Man, as well as designing stealthy hybrid bikes for covert operations. "Plan X" sounds like its wildest idea to date, though, as it ultimately aims to turn the real world into 3D that military personnel can access via an Oculus Rift. In this crazy virtual world right out of the movies, soldiers would be able to shoot down hackers like on the battlefield. Drone initiatives are par for the course, as well. Apparently, DARPA's in the process of turning old surveillance drones into WiFi hotspots, conjuring up a design for drones that can transform into whatever the military needs and developing robotic sea pods that release drones on cue. You didn't think an agency as forward-thinking as DARPA would limit itself to Earthbound technologies, did you? One of its space programs, called XS-1, is working toward building an unmanned spacecraft that would be a lot cheaper to fly than current models. Then there's the Phoenix program, which aims not only to salvage working parts from dead satellites, but also to send robots to space to assemble satellites on the spot. Also, DARPA's been working on the Space Surveillance Telescope since 2002 in hopes of providing a means to capture images of small objects floating around, including space debris that could collide with and destroy military satellites. As you'd expect, a military agency that receives billions in funding is bound to have its share of controversies. In 2011, it was discovered that DARPA signed a $1.7 million contract with a bomb-detection firm owned by the family of its then director, Regina Dugan. That even prompted the Pentagon to conduct an ethics probe on the agency, though it was later cleared of any wrongdoing. Still, controversy followed Dugan when she left DARPA for Google, especially since a Washington federal appeals court ruled that any Google-NSA relationship could remain a secret, just as she made the transfer. Needless to say, that development led people to wonder whether DARPA had anything to do with the NSA's efforts to snoop on Gmail accounts. There are two possible classes of weapons that may be described as enhanced-EMP nuclear weapons. One is based on commonly known physics, and I will describe it briefly below. This first type, although never tested above ground, almost certainly exists now in the arsenals of several countries. The E1 EMP from a nuclear weapon is generated from gamma rays emitted by the weapon within the first microsecond after the nuclear detonation. One way of enhancing the EMP is simply to make sure that the weapon is constructed so that as much of the gamma radiation as possible escapes from the weapon and is radiated into the upper atmosphere in a wide area below the detonation. This can be done as described in the first section above. The (relatively) gamma-ray-transparent casing only needs to be on the lower side of the weapon. The gamma radiation that is emitted upward into outer space is wasted. The high-explosives on the earliest known nuclear weapons was quite thick, as was the very heavy outer casing. Even in the case of the 1952 super-oralloy fission weapon, which was quite sophisticated for its time, the chemical high-explosive surrounding the spherical shell of U-235 was 44 centimeters thick. When most people talk about super-EMP weapons, though, they are generally talking about nuclear weapons that can generate field strengths of much more than 50,000 volts per meter. This would require a much different design than "ordinary" nuclear weapons. Staff members of the United States EMP Commission have stated that there are nuclear weapons in existence that can generate 200,000 volts per meter below the detonation and 100,000 volts per meter near the horizon. This would have to be done by generating gamma radiation with energy levels that are far in excess of the energy levels (of about 2 million electron volts) generated by nuclear weapons described in open publications -- and by also generating a pulse of these gamma rays very rapidly. In first and second generation nuclear weapons, the prompt gamma radiation reaches its peak a few tens of nanoseconds after the nuclear detonation begins. In super-EMP weapons, it is likely that the gamma radiation would reach its peak output within a nanosecond or two of the beginning of the nuclear reaction. One consequence of this is that the frequency components in these super-EMP weapons would be much higher, making the problem of shielding and transient protection much more difficult than simply protecting against higher field strengths. The problem with the important references in Dr. Schneider's paper is that they are available at the Open Source Center, at http://www.opensource.gov, which is only available to employees or contractors of the U.S. federal government who have a specific need to access these documents. The referenced documents are not secret or otherwise classified documents in the normal sense, but they are nevertheless very difficult for the average citizen to obtain. The most worrisome aspect of these super-EMP weapons is the possibility that the construction process might be rather straightforward. Beyond the rather complex industrial capacity that it takes to produce a basic nuclear weapon, it may be that the only additional thing required to produce a super-EMP weapon is the knowledge of how to do it. If this is the case, then any country with a nuclear weapons program may be able to produce a super-EMP weapon without too much additional difficulty. Although no details about super-EMP weapons are given in open publications by anyone who knows about these weapons, there is a strong implication in the statements of those who have studied the reports about those weapons that the enhanced gamma radiation weapons would have a comparatively low total energy yield. This means that weapons with an unusually intense E1 output would not cause a large E3 output. If this is the case, then they would be very destructive to electronic devices, but would not produce the large DC-like currents that would be likely to destroy large numbers of the largest transformers in the electrical power grid.